Last summer, Sport Court won a project to install 30 multipurpose courts in Kabul, Afghanistan through an American non-governmental organization. In order to expedite the installation process, the courts were laid out and pre-painted in a local warehouse. They were then dismantled, shipped from the Salt Lake City factory to Karachi, Pakistan and finally driven to their destination in Kabul. In this photo the courts are laid in our warehouse where the game lines were pre-painted prior to their journey to Kabul. The court lines painted in in our local warehouse. During a whirlwind five days in Kabul, the Sport Court team was able to train the local installation team and complete a full court at the Taimaskan Boys’ Orphanage and begin laying tiles at courts at the Kabul Boy’s school and Kabul Olympic sports complex. The boys at the Taimaskan Boys’ Orphanage will have a safe and fun Sport Court courts to play and exercise on for years to come! Shortly after installation, the boys were eager to try out their new courts. The Boys at the orphanage playing on their new Sport Court. This overhead photo of the Olympic sports complex court was taken from the top tier of the national soccer/football stadium. After only five days working side-by-side with our Sport Court team, the local Afghan installation team was completely self-sufficient. In the next months, they will continue to install the remaining 27 courts at boys’ and girls’ schools and orphanages in 6 different provinces throughout the country. The Afghan installation team works on assembling a hoop. The Afghan installation team takes a break for lunch. 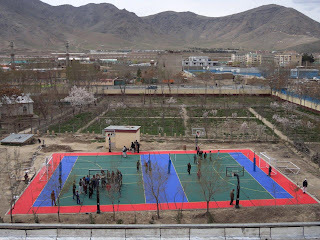 Sport Court is grateful for the chance to impact young lives in Afghanistan and provide them with a safe and attractive courts to play on. Our teams’ hard work and the hard work of our counterparts in Kabul will be enjoyed by the children for year’s to come, and Sport Court is very proud of the legacy it is fostering in Kabul. 30 sets of Putterman official Futsal goals. The court is complete and ready to use! The boys at the Taimaskan Orphanage are happy to have a new surface to play on!